BAMF Style goes green for the first #MafiaMonday after St. Patrick’s Day! We catch up with Ben “don’t-call-him-Bugsy” Siegel in the middle of realizing his dream – the Flamingo Hotel and Casino and, by extension, Las Vegas. In reality, Siegel had far less to do with the development of the “Entertainment Capital of the World” than legend would have it, though it certainly remains his biggest claim to fame… as well as the mob’s biggest reason for wanting him out of the way. Alas, our hotheaded gangster is far from a good businessman, brushing aside updates that his project is astronomically over budget with “no problem” and platitudes of its ilk. He’s far too distracted, first by his smooth architect’s not-so-obvious advances on his girlfriend Virginia Hill (Annette Bening), followed by the fact that Benito Mussolini was killed before Bugsy could do it himself, and finally by the appearance of Harry Greenberg (Elliott Gould), a dopey gangster from Ben’s past who had no idea that the very last place he should have gone to was his old pal’s doorstep. While Bugsy may otherwise be delighted to welcome an old friend to his swanky L.A. pad, Harry is on the run after his testimony was supposedly a key element in Lucky Luciano’s imprisonment and subsequent deportation. Bugsy is duty bound by his mob ties to pull the trigger on his unsuspecting – or, more appropriately – unwitting old friend… ultimately giving Bugsy one more complication that he certainly doesn’t need. The movie condenses nearly the final decade of Bugsy’s life into about two on-screen years, pushing the murder of “Big Greenie” Greenberg up from its actual date of November 1939. You can read more about it in the official Daily Mirror news coverage of Siegel’s trial from January 1942, but the facts are that it was more of a mob operation with fellow gangsters Whitey Krakow and Frankie Carbo in on the hit. 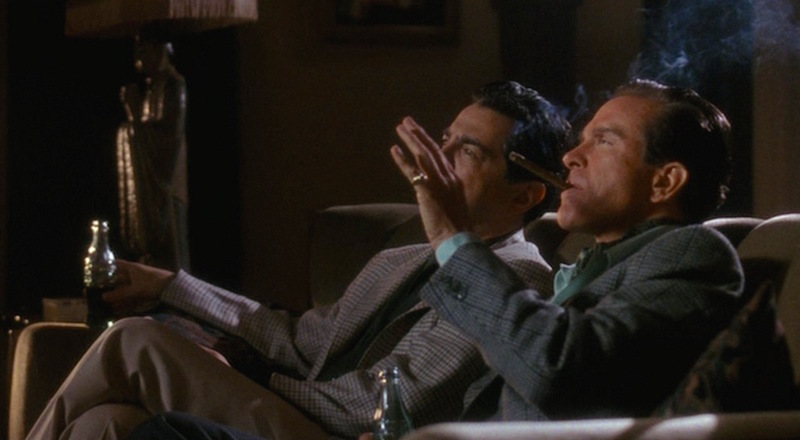 Siegel drove the trio to Greenberg’s house on Vista Del Mar in Los Angeles, where Carbo shot Big Greenie five times. Bugsy made no secret of its taking artistic license with the facts, least of all sentimentalizing its subject’s dastardly deeds by showing Bugsy’s internal struggle even though it’s likely that the real-life Siegel, known to have been a violent psychopath, had few if any qualms about organizing the murder of his former associate. 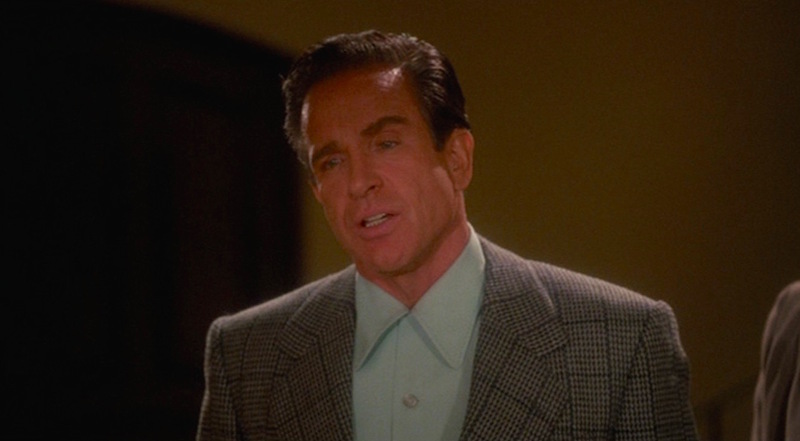 Bugsy makes the most of his relaxed environment after making the move from New York to L.A. by swapping out his wardrobe of gray double-breasted business suits for a natty collection of plaid and checked sportcoats. This particular jacket is patterned in a gray-and-green check with a dark teal overcheck. The single-breasted front has moderately wide notch lapels that roll to a low-stance two-button front. The ventless jacket has a welted breast pocket, the hip pockets are likely jetted, and there are three buttons at the end of each sleeve. The shoulders are structured in the fashionable style of the mid-’40s with padded shoulders and roped sleeveheads. Bugsy finds himself embroiled in yet another lovers’ quarrel with Virginia… at a very inconvenient time. Bugsy calls out the green in the jacket with a mint green silk long-sleeve sport shirt. The shirt has a large collar with rounded edges. 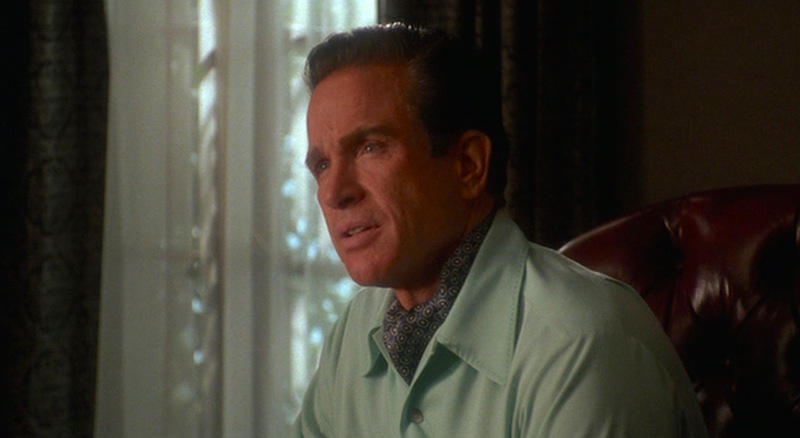 To button the shirt at the neck (something Warren Beatty proved his fondness for doing in Bonnie and Clyde), a small button under the right side of the shirt collar fastens to an extended loop on the left side of the top opening, concealing the fastened button under the right side of the collar and creating the effect of a point collar. The shirt has a plain front for the mother-of-pearl two-hole buttons, two flapped patch pockets on the chest with a stitched green monogram adorning the left pocket flap, and rounded single-button cuffs. An extra sporty touch is the edge stitching visible along the collar and pockets. Bugsy’s no architect, but that won’t stop him from making major changes (“the pool bothers me”) with an already inflated $2 million budget. Bugsy buttons the shirt up to the collar for his evening outing with Harry and Virginia, but earlier in the day, he appropriates the look of a man at leisure, unbuttoning the top of the shirt to reveal a dark green silk foulard silk day cravat. The cravat’s foulard print appears to be a geometric pattern of indigo shapes with white borders and white center dots. Bugsy receives news that an old friend made a very bad decision. 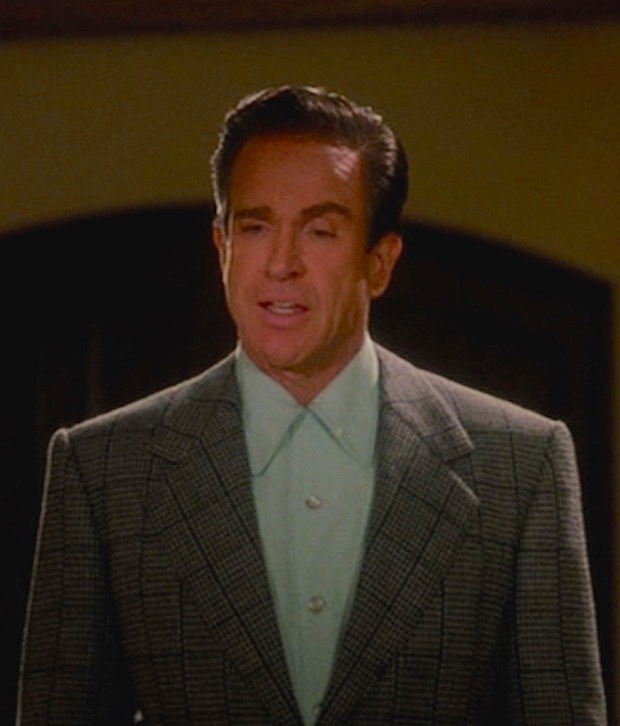 Fortuitous for the filmmakers, trousers in the early ’90s shared many stylistic similarities with those of the mid-1940s, so Warren Beatty could be just as fashionable in either era with his dark gray wool double reverse-pleated trousers. The rise is somewhat lower than one would have seen on most trousers in 1991, however. Bugsy’s trousers have straight side pockets, jetted back pockets that close with a button, and turn-ups (cuffs) on the bottoms. He wears them with a dark brown leather belt. 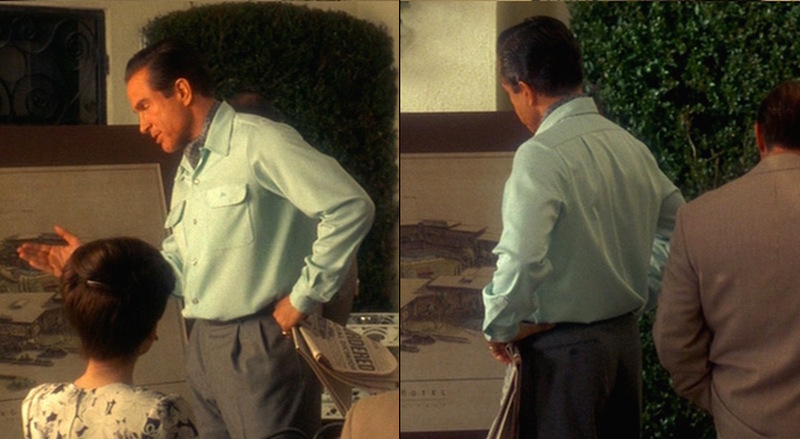 In the brief amount of screentime awarded his footwear, Bugsy appears to be wearing the same light brown suede desert boots that he wore with his black-and-white gingham check jacket when first envisioning the Flamingo in the middle of the Mojave Desert. This sartorial decision dances with anachronism as desert boots weren’t popularized until the following decade, following their formal introduction to the world at the 1949 Chicago Shoe Fair, two full years after Bugsy Siegel was killed. True, the desert boot had been in development throughout the ’40s following Nathan Clark’s first observance of the boot in Burma in 1941, but it’s highly unlikely that even a clotheshorse like Bugsy would have been so fashion-forward as to crib his kicks from the British Eighth Army. Bugsy’s usual gold tank watch goes unobserved in this sequence, but he still wears his gold ring with a dark stone on his left pinky. Gangster movies are slightly closer to Bugsy’s wheelhouse than hotel design. The outfit is also briefly seen earlier during a brief vignette of Bugsy screening a movie with George Raft (Joe Mantegna) in his private viewing room. Eagle-eyed viewers will note the film in question to be the original Scarface, released in 1932. Scarface is notable as George Raft’s breakout role, for which the actor had tapped into his real-life memories growing up around gangsters like Bugsy Siegel, who had been his childhood pal. Seeking the soundtrack for the sort of comfortable spring day that finds you in a silk day cravat? 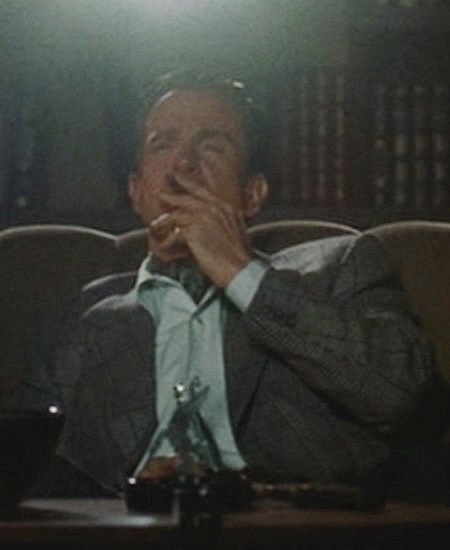 The scene is punctuated by Glenn Miller and his Orchestra’s 1941 recording of “Perfidia”… a bit on the nose as ol’ Bugsy is about to commit a touch of perfidy himself. Penned by Alberto Domínguez with Milton Leeds contributing the English lyrics, “Perfidia” was the song to beat in the early ’40s. It was first published in 1939 and became an instant hit for Xavier Cugat. It was a mainstay for “exotic”-set films at the time, including a background scene in Casablanca (1942) and in Father Takes a Wife (1941), where audiences were treated to Desi Arnaz serenading them with the original Spanish lyrics. A scene from the director’s cut reveals a distraught Bugsy late at night, steeling himself up to commit suicide with a glass of whiskey and a Colt Model 1903 Pocket Hammerless pistol… evidently the same one he had just used to kill Harry Greenberg. 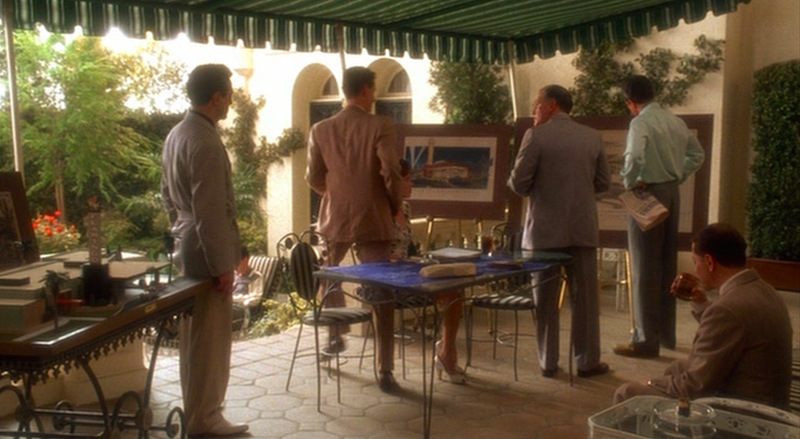 Virginia, sensing Bugsy’s motives, slyly grabs his piece from the table beside him. While it’s laughable to even entertain that the real Bugsy had any remorse about killing, let’s discard that dissonance for the sake of the movie and give a few words to the pistol. After a half-century of revolvers dominating the global handgun market, the advent of the semi-automatic pistol in the late 1890s and early 1900s set major firearm manufacturers on a mission to create a easily concealable yet undoubtably lethal pistol for the mass market. The firearms designer John Browning had an early hit for the Belgian firm Fabrique Nationale (FN) with the Model 1900 pistol, which Teddy Roosevelt reportedly kept in his bedside table, but it was naturally Colt that changed the game with its Model 1903 Pocket Hammerless pistol, also a design by the august Mr. Browning. Chambered at first in .32 ACP followed by the slightly more robust .380 ACP (the “Model 1908”), the Colt Model 1903 Pocket Hammerless is smooth in all aspects – from its aesthetic to its operation. Despite its “hammerless” moniker, the pistol actually has a hammer though it is always covered by the back of the slide to prevent it from snagging when drawn by the user… allowing for easy carry that made it a popular personal choice for lawmen and lawbreakers alike. 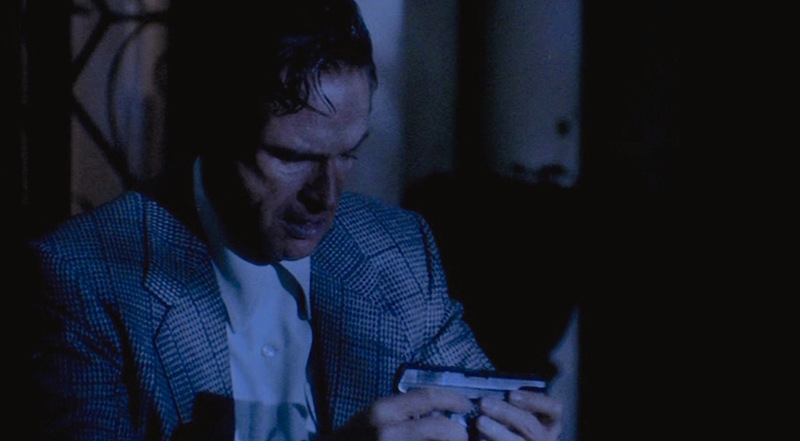 One particular lawbreaker, Bugsy Siegel, looks over his Colt Model 1903 Pocket Hammerless. 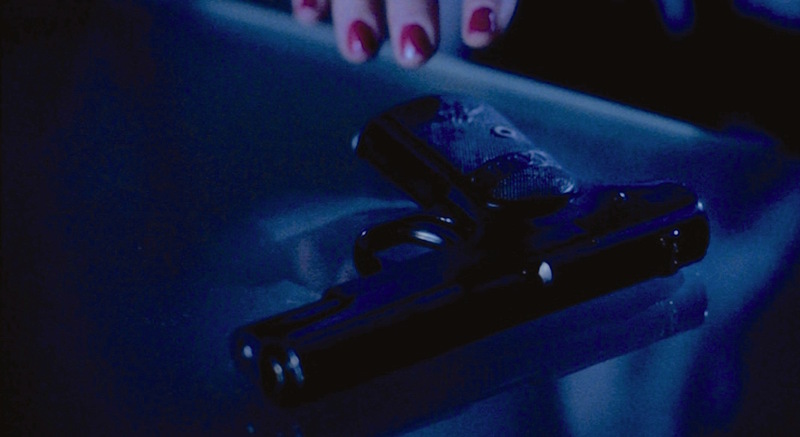 While we don’t see Bugsy using this gun to put his old pal to eternal rest, we do see Virginia firing it during a moment of distress, shooting out the leg of a piano that the home’s former owner, Lawrence Tibbitt, no doubt used for more artistic pursuits than target practice. Bugsy puts the businesslike world of the New York mob behind him, fully embracing an L.A. life of leisure with his checked jackets, silk sport shirts, and patterned day cravats. You may also find it in your interest to learn a little more about William R. Wilkerson, the early 20th century entrepreneur who had far more to do with the development of Las Vegas and the Flamingo than legend gives him. He also had a hand in the development of many Hollywood hangouts frequented by Bugsy and his famous pals, including Cafe Trocadero and Ciro’s, both on Sunset Strip. His son, W.R Wilkinson III, wrote a brief book, The Man Who Invented Las Vegas, that seeks to correct the history that often neglects his father’s legacy in favor of the juicier mob legend. Did they put a price on Michelangelo’s Sistine Chapel or Shakespeare’s Macbeth? If it costs more, it costs more. No problem. Great post. 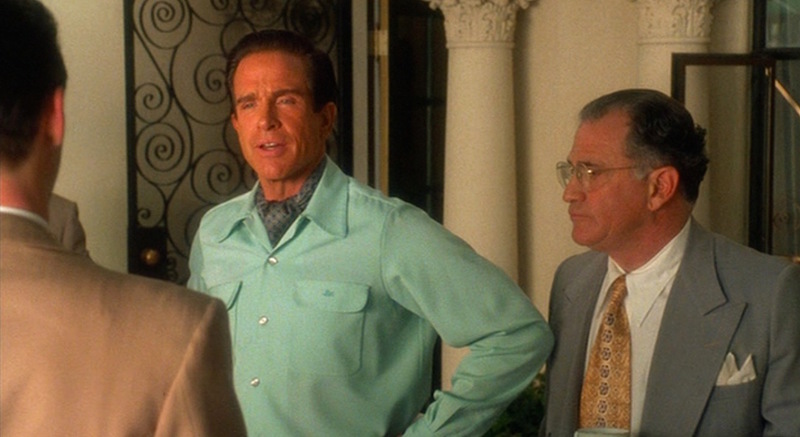 I always like Beatty’s outfits in this movie. Very sharp.